MiniTool Partition Wizard is a rich-featured partition magic, which is designed to optimize disk usage and to protect your data. It comes with so many powerful features with which you can completely control your hard disk and partition. With its user-friendly interface and straightforward guidance, you are able to resize partition, copy disk, scan lost partitions, and migrate OS to SSD easily and safely. 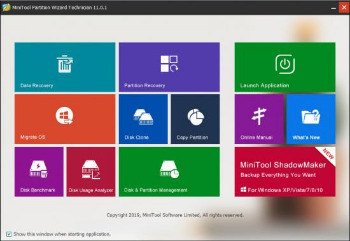 Due to its outstanding performance, MiniTool Partition Wizard Free Edition has earned good reputation among global users. Set partition logical to create more than four partitions or set partition primary to make it active.? Bug fix for Disk Copy stuck at native mode. Bug fix for Partition Recovery fails on MBR disk larger than 2TB. Bug fix for external dynamic disk showing as bad disk. Bug fix for incorrect software prompt message. Bug fix for unable to create mirrored volume in Windows 10. Bug fix for drive letter not showing up after formatting a partition from Ext to NTFS. Bug fix for user setting not kept after software relaunch.